Frances E. Wells was born March 5, 1919 and grew up in Rochester, New York. 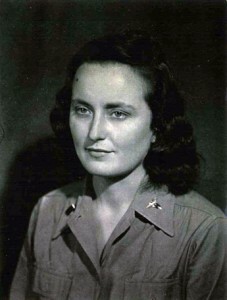 She majored in nursing at the University of Rochester, joined the Army in 1943, and served in North Africa and Italy. She wanted to be close to the front to nurse patients with recent wounds so transferred to the 8th Evacuation Hospital in southern Italy. 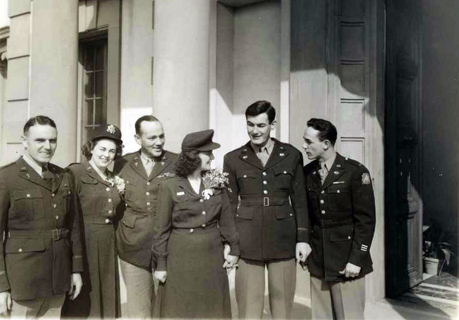 In February 1945, while the war was still raging, she married Frederick M. Broadfoot who had been born March 4, 1920 in Paterson, New Jersey and was a captain with the Cryptography Unit of the Signal Corps. Their wedding was at St. James Episcopal Church in Florence which is about 40 miles from Pietramala where the 8th Evac was then stationed. Naturally, most of the patients at the 8th Evac were from the United States, but the hospital did treat soldiers as well as civilians from other countries, including the Axis powers. Frances told of caring for a wounded German soldier. One night when she started to pull a mosquito net over him, he became fearful. She supposed he thought he was being covered as if he had died. When she made a buzzing sound, moved her finger in a circle, and swatted her arm, he smiled and relaxed. The nurses followed the adventures of one of their own who put in papers several times to marry. By the time the request gained approval, she was going out someone else. The women joked that the only way she could get married would be to send in blank papers. Frederick’s mother, concerned that the Army might not have enough soap, sent him with extra bars. The army was well supplied so he gave the ones from home to a family he had befriended in Naples. The Neapolitan mother sewed a bathing suit for him from a towel, and her daughter, Lulu, embroidered her name across the back of it. Frederick also told the story of being on a hill in Italy with a friend and looking up to see bombs falling. The bombs appeared round which is when the men realized they were coming right at them. They ran away as fast as they could and lived to tell about it. There were recreational trips to Florence. On one visit Frances and Frederick tried to find the Bargello, an art museum with a famous staircase and courtyard decorated with coats-of-arms. They walked and walked and finally passed a courtyard with a plain sandbagged staircase with no plaques anywhere. Probably aware that many moveable art treasures of Florence had been taken to out-of-the-way places for safety before the Allies ever arrived, they must have thought that the coats-of-arm would have been more intrinsic to the walls and still be displayed. But the walls were bare. From the left: Chaplain William Laird, bridesmaid Ellora Endicott, Colonel Staige Blackford who gave the bride away, Frances, Fred, and best man Ted Marks on the villa porch where the reception was held. One night they drove to the opera in a freezingly cold, open Jeep with no lights because of the wartime blackout. Italian families brought baskets with salamis, loaves of bread, and wine to enjoy during the opera. When Frederick wrote his parents that he was planning on getting married, his mother took off her diamond ring, wrapped it in cotton, put it in a metal Kodak film canister, and mailed it to her son. Frances and Frederick probably met at a dance, maybe in the summer or fall of 1944, as they put in their request to marry in November 1944. Frances was offered a military ambulance to use as a “getaway car” after the wedding, but she held out for a staff car. 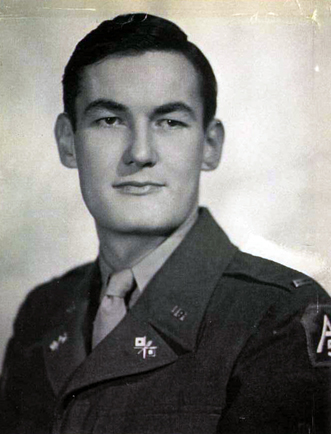 After the war Frederick graduated from the Dickinson School of Law in Carlisle, Pennsylvania and worked as a lawyer. Frances died in October 1985. Frederick died in June 2001.